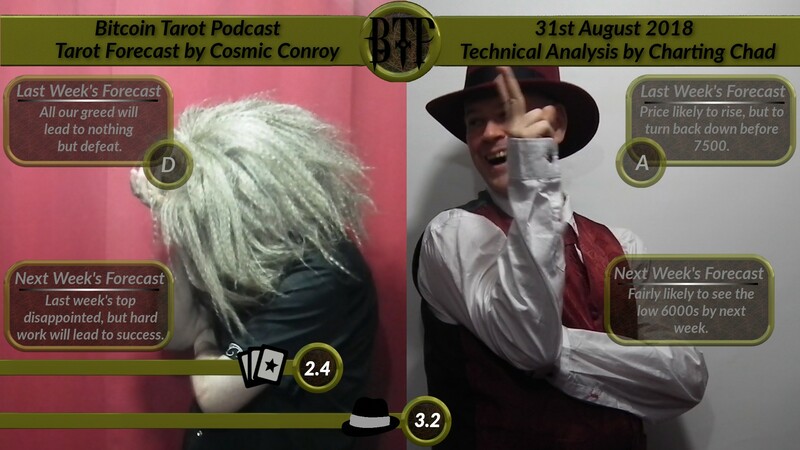 In this week’s #Bitcoin #Tarot #Podcast, Chad’s Technical Analysis extends it’s lead over Conroy’s mystical tarot readings, but will next week’s predictions fall the same way? What will happen to the price of Bitcoin? And can Technical Analysis do any better than the Tarot? Click now to find out in this week’s Bitcoin Tarot Podcast. [Tarot-Synopsis] Last week’s top disappointed, but hard work will lead to success. [TA-Synopsis] fairly likely to see low 6000s by next week.